I’m sure I’m not the only person who spent Easter have a jolly good sort-out. Amongst other things, I found a stack of tea towels, set aside as just too nice to be used to dry dishes, and amongst them were a pair of Hope and Greenwood tea towels I was given as a gift. As I wondered what I could use them other than dish-drying, inspiration struck. 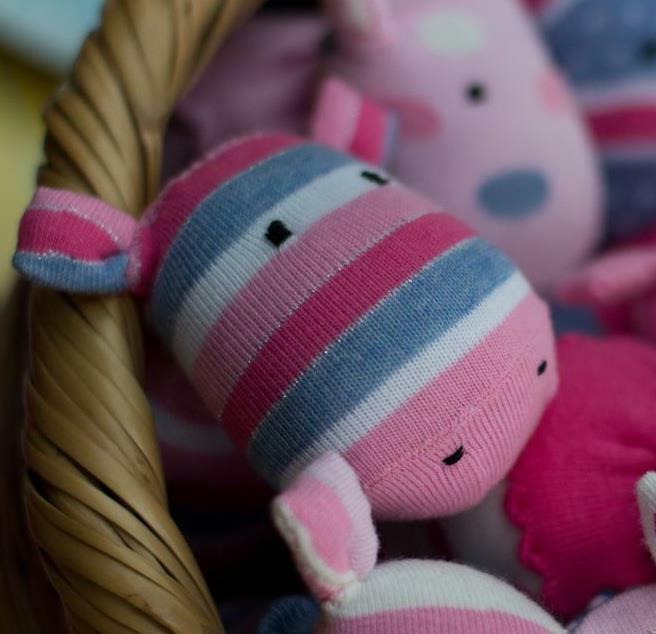 Since the boys arrived, we have constantly found ourselves scrabbling to find a handy home for their shoes, socks, hats, bubbles – general outdoorsy bits and bobs, as well as our own slippers, my gardening gloves, welly socks, etc etc etc. 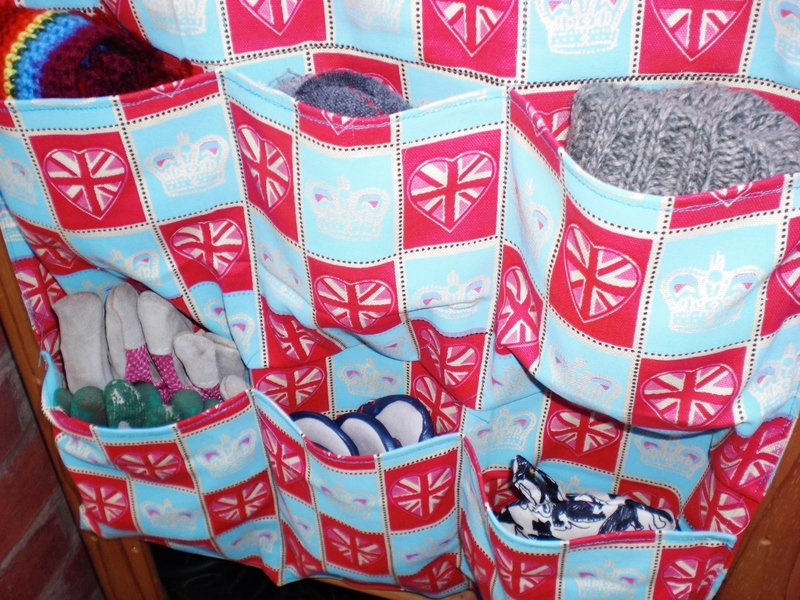 I thought an organiser to hand beside the front door would answer all our needs, and look pretty to boot! 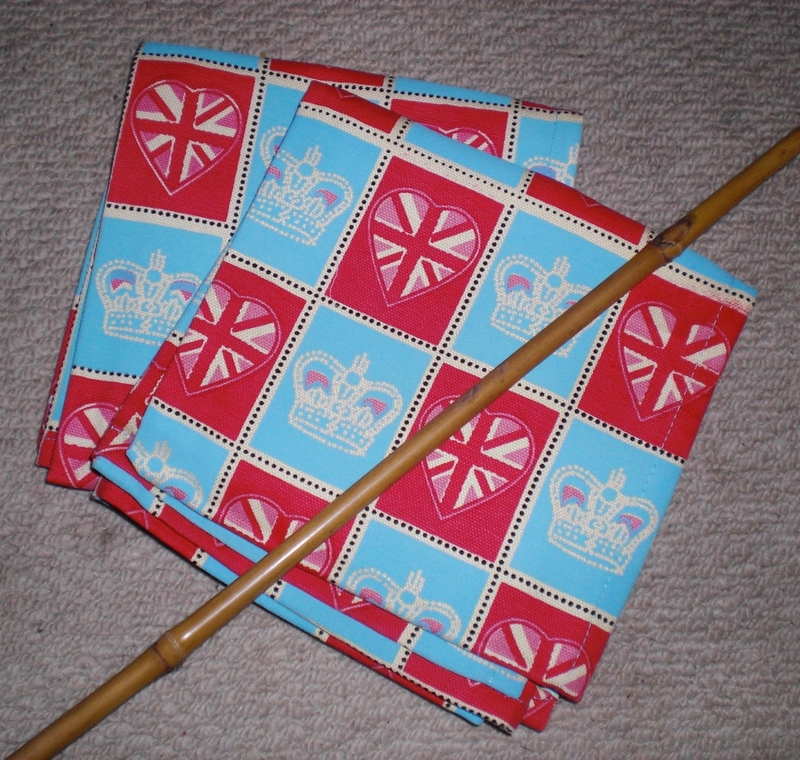 2 tea towels and some doweling or cane cut to size. You don’t have to have two identical tea towels – one plain for the back and a patterned front would work nicely! 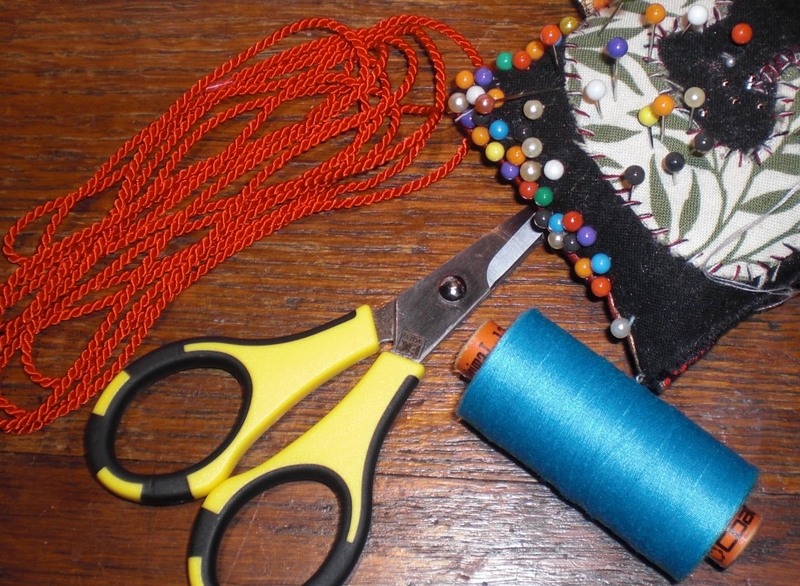 Scissors, cotton, some cord or ribbon, pins, and not shown: a tape measure/ruler and sewing machine. Begin by unpicking the top of your backing towel. If you have two identical towels, check the size, and use the slightly narrower of the two for the back. 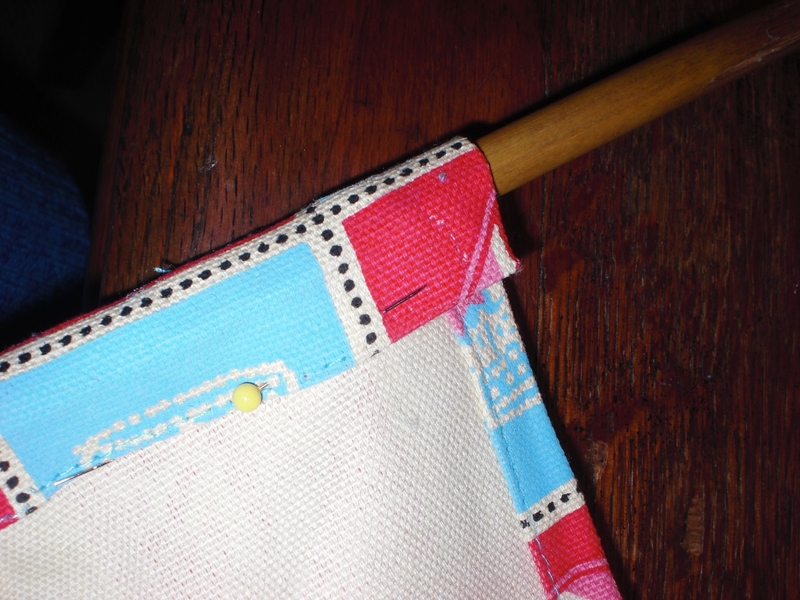 Once you’ve unpicked the top, fold the hem back over the cane, and pin in place. Machine across, leaving the ends open to slide the cane through. Now, measure your top tea towel and divide into three roughly equal sections. If, like mine, your towels have a pattern that looks better divided up slightly unevenly, go for it! Unless you’re making your divider for a particular purpose, in which case you’ll need to stick strictly to your measurements. Unpick the side and bottom seams – leave the top in place. Hem the top of the two lower sections. Measure and mark the base tea towel with three equal sections, line up the three sections you’ve cut and hemmed, and fold downwards to pin in place. Sew with two rows of machine stitch approx. 1/4″ apart. Now pin the side seams and machine top-stitch up both sides. Where you’ve unpicked the seams you should find you’ve a pressed-under edge, which will give you a neat finish. You should also have bought yourself a little give for the pockets – line up the edges at this point and don’t worry about the top lying flat against the back. Now measure across the tea towel and split into three again (or, again, more/less if you have a different or particular use in mind). Machine top-stitch up each of the two dividing lines to create three pockets for each section. Finally, push your dowel through the seamed top. If you’re using dowel you may want to drill a couple of holes to feed your cord through for a professional finish, or create grooves with a file to hold your cord in place. I used cane, and used a hand saw to create a split in either end, then slid the cord through before knotting. 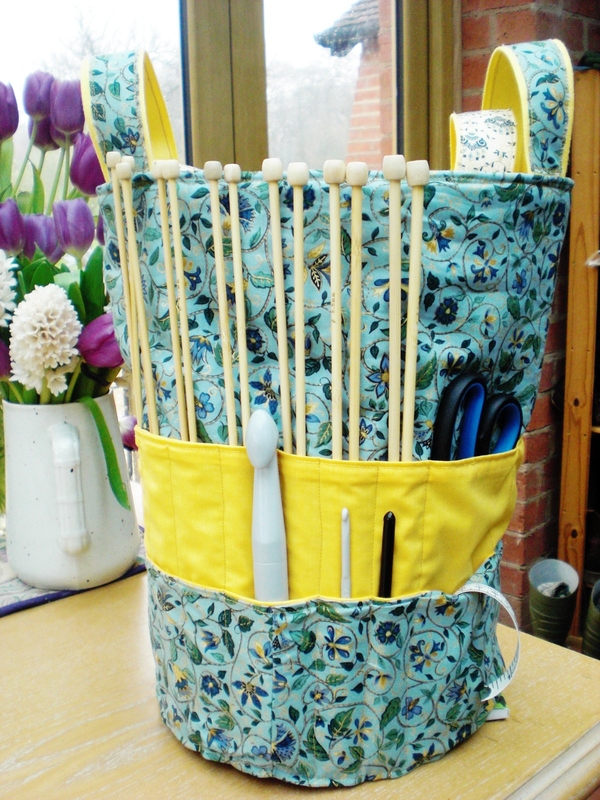 And voila – one organiser! Or in the kitchen to hold your most-used cooking utensils. Or use a single tea towel, fold up the bottom and weight the top to create a handy remote-control store. Or to hold rolled-up belts, socks and ties. 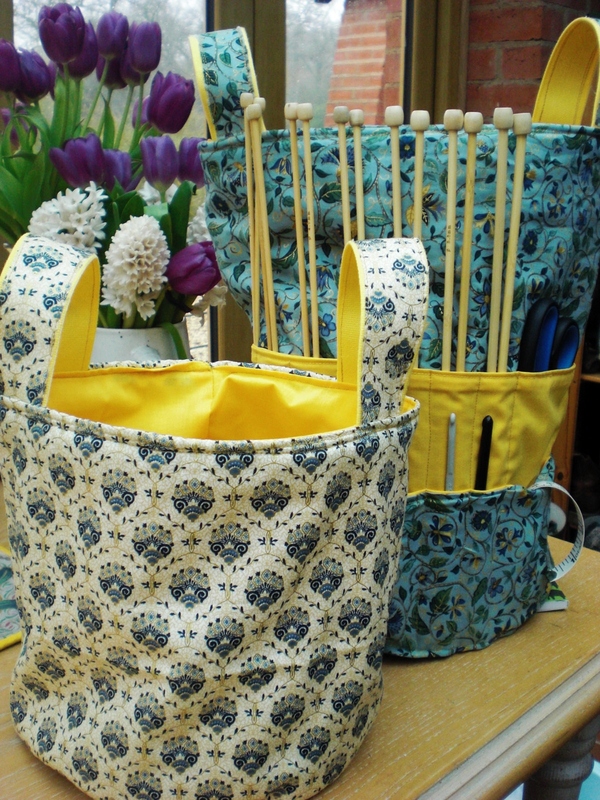 Or for a knitter, with dedicated pockets to hold needles, yarn and patterns. Or find a tea towel with a herb theme and make double pockets to hold seed packets alongside herb plants – could be hung outside or inside depending on space, for a handy vertical kitchen herb garden! Let me know how you would use it! Yes, I know that Mother’s Day was a little while back, but although I began planning this project in February, I didn’t get started until the week after Mother’s Day. I had good intentions… but you know what they say about those! 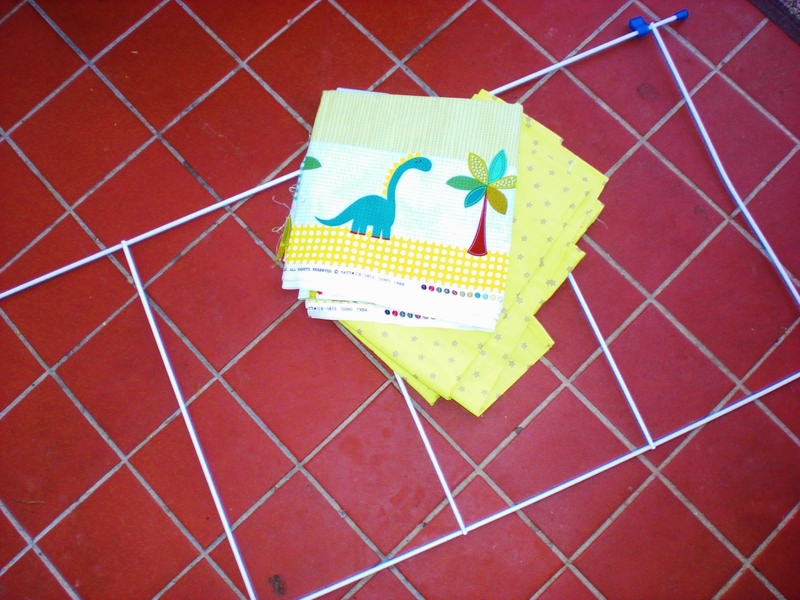 I may have been a little slow to start because the initial planning stages required the application of trigonometry. It has been a long time since GCSE maths, but a quick google refreshed my memory that the diameter of a circle could be calculated by the circumference ÷ π. Which was much simpler than I remember it! My Mum had been pinning knitter’s totes like a woman obsessed, and turning up weekly at ours with a carrier bag of wool and needles, so I knew exactly what I wanted to make. 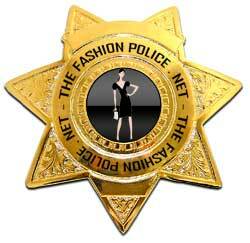 But I also knew from my own experience that I wanted to tweak things a little, to make one unlike any I’d seen online. There are a few tweaks I’ll need to make before selling these – I’d like to make it maybe an inch taller and check my measurements, as the taller pockets don’t line up perfectly at the seam. But otherwise, I’m chuffed to bits with this project! And I think Mummy was too. Our shoe shelves are a good idea in theory. 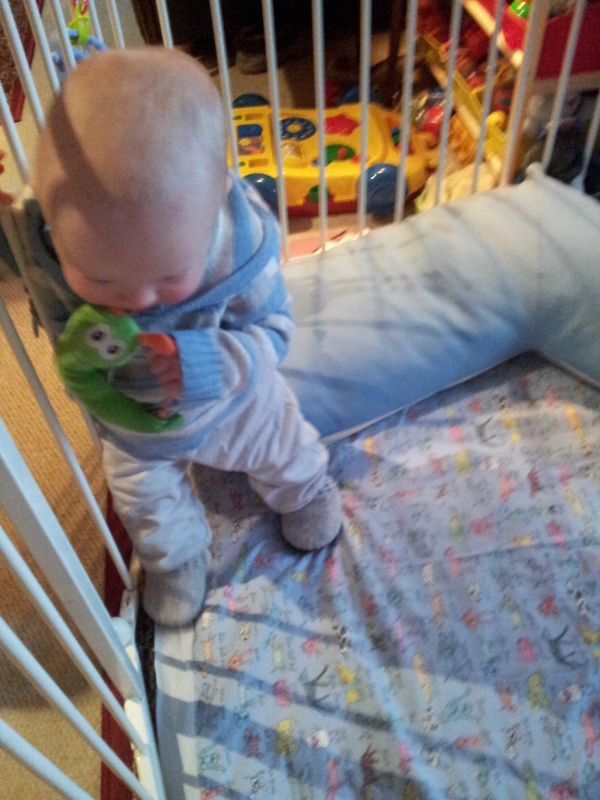 When we first put them up with our shoes neatly aligned, they looked smart. 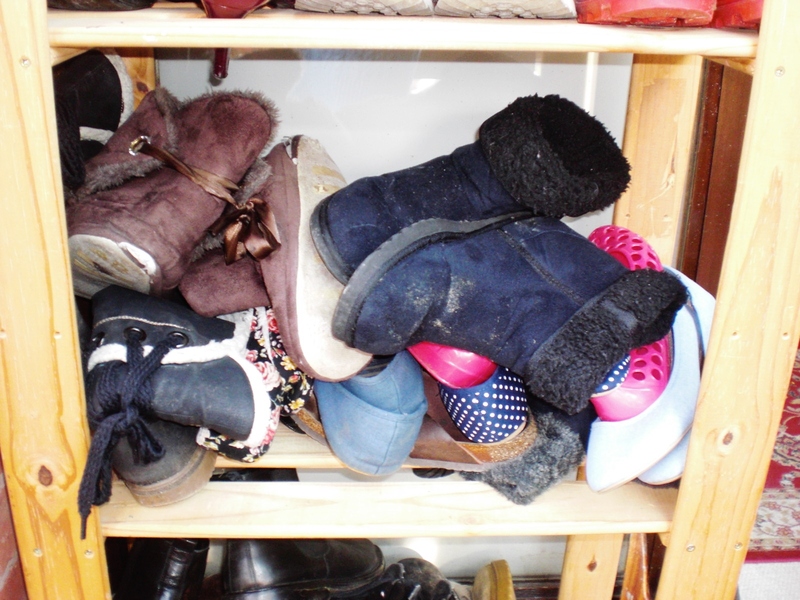 But we all know that shoes don’t stay neatly aligned – they get taken off and chucked, unceremoniously wherever they’ll stay put without sliding onto the floor. They get pulled from the bottom of the pile, without a care for those piled atop them or where they might end up. In short, they look something of a mess. 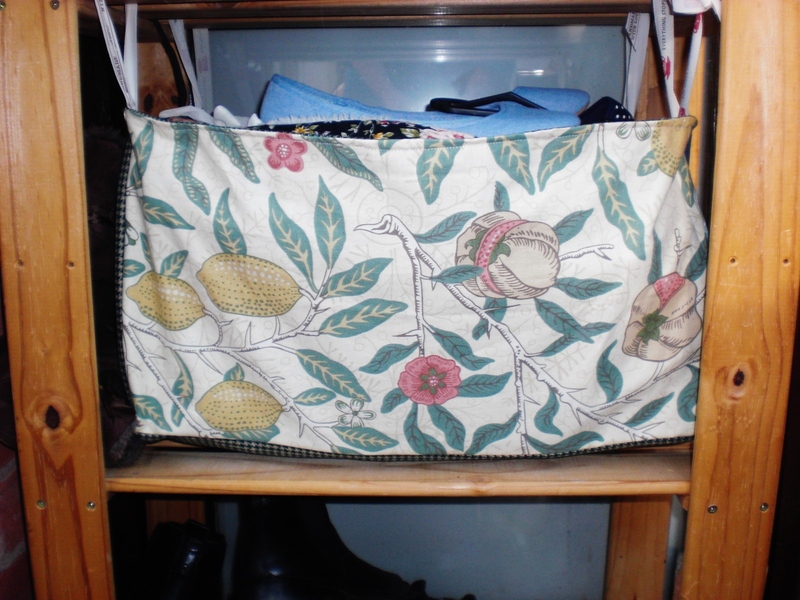 30 minutes and a patchwork of upholstery fabric from my stash later, and I have a soft fabric bag, suspended from the shelves above by ribbons, to hold all of my slippers, sandals and ballet shoes neatly out of sight. I could have quilted this to give it more structure, or used card or plastic to stiffen it, but I wanted something I can chuck into the washing machine without worrying too much about it. Because shoes get mucky, y’know? Earlier this week I noticed that the boys’ feet were getting rather chilly. A root through the hosiery drawer turned out one pair of slippers, but not a second. After a few minutes trawling through ebay I realised that even to buy a pair second hand, with the extortionate P&P costs involved these days, would cost me around a fiver, which seems daft when I haven’t really a fiver to spare. So I set to work trawling the interwebs for some simple slipper tutorials. My first pair of slippers, and the pair which wee Hal is currently sporting, were based on this tutorial. 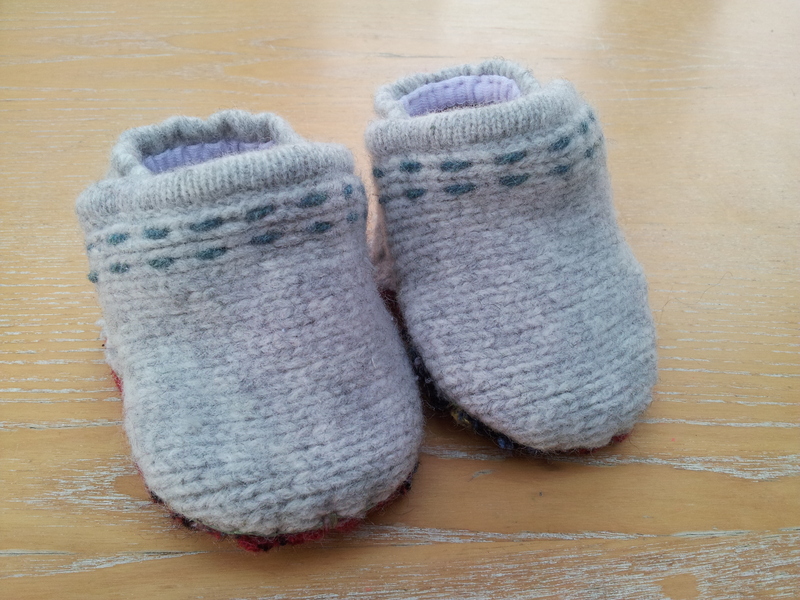 Simple, quick and effective, these were made from a felted baby cardigan that I bought off ebay without realising that the seller had already shrunk it down in the wash – and so it was too small for my boys. I repurposed some elastic cut from a jersey fitted sheet which gave a pleasing finished effect as well as putting an existing scrap to use. I’m reasonably pleased with the results. 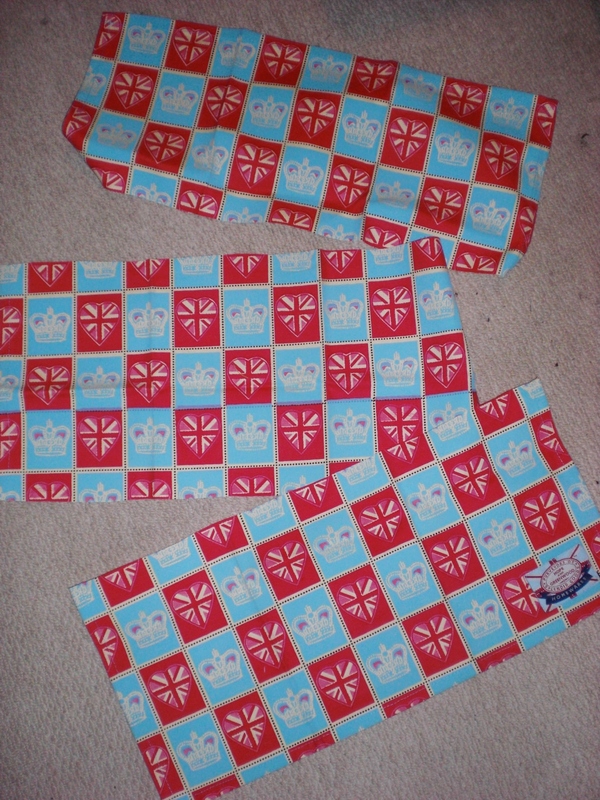 However, whilst searching for slipper patterns, I also found these little beauties. I was all ready to buy this pattern, when I realised that it was sold out! So, I’ve been devising my own pattern loosely based on the design. 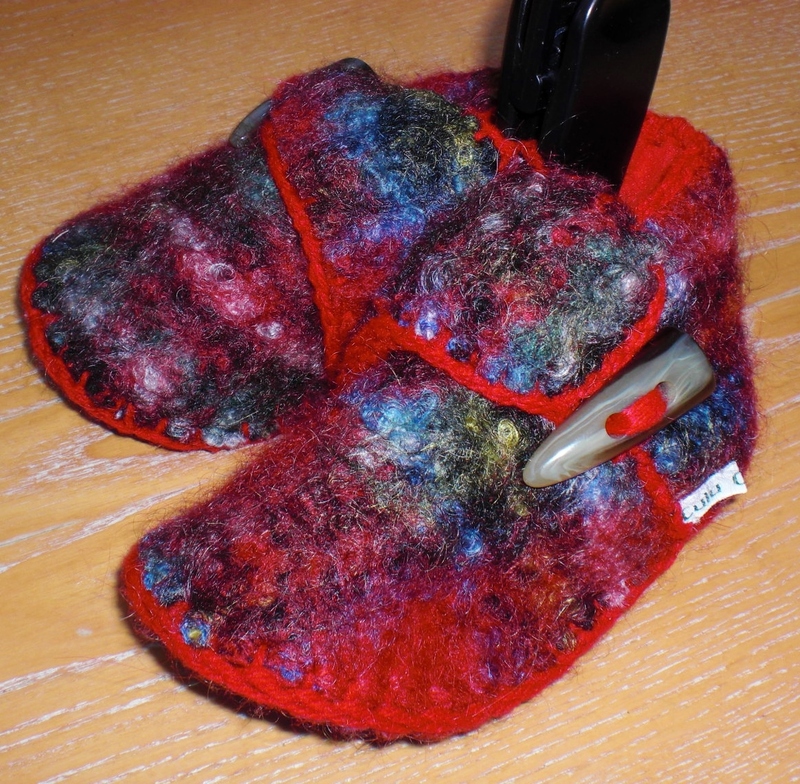 The first pair came out a little wonky, but the second pair are shaping up well – and proving an excellent use for scraps of felted wool too! I’ve been struggling to find an accessible display option for our picture books for some time. I had tried book ends, but they looked so messy. I tried a rectangular basket, but it took up a LOT of space. I found a lot of potential ideas online, but they mostly required the use of wall space, and whilst we do have a little empty wall space, our delightfully ancient walls are solid as iron and rock (after several hundred years both wooden beams and bricks seem to repel even electric drills! ), so wall-mounted solutions are not really an option. I was fast running out of ideas. After a failed attempt at a table-top bookstand made out of cereal boxes (not sturdy enough, but will be great for my sewing patterns and PDFs!) 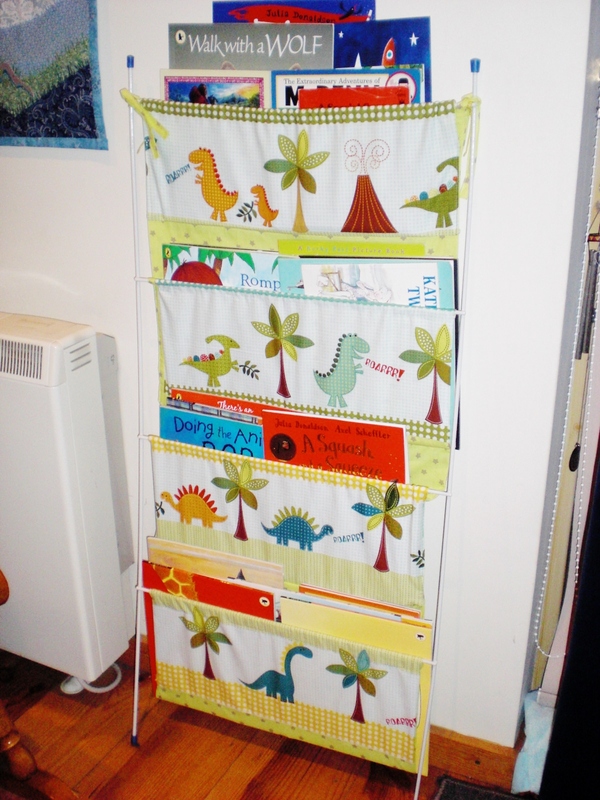 I was busily about the bedtime nappy change last week when I spotted one half of a broken clothes airer which I have mounted on over-door hooks on the wardrobe to provide some extra hanging space for baby clothes and towels. 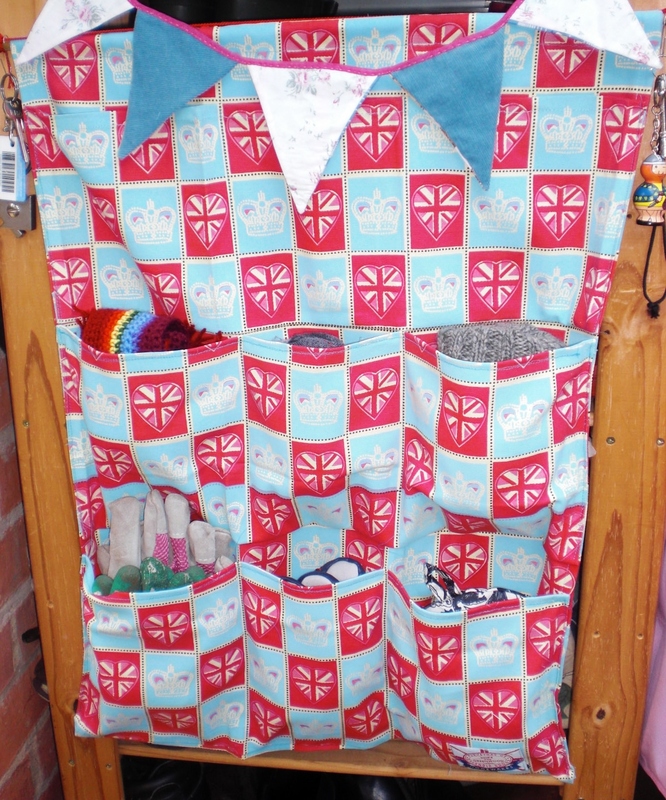 Inspiration hit – the other half of the same airer was in the shed, and would make a great frame for a book sling. All I needed for this was the frame and some fabric. 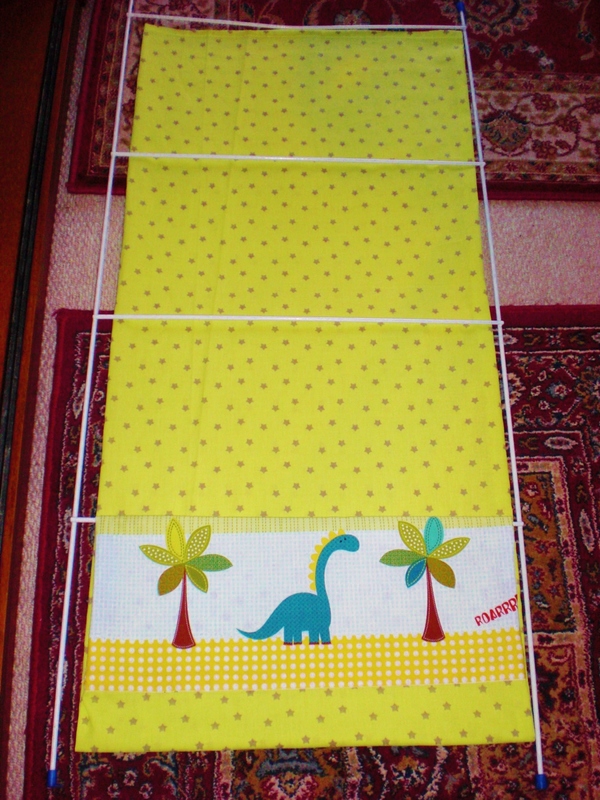 To make things extra difficult, I decided I wanted to use some lovely Michael Miller dinosaur-print fabric I bought from Plush Addict last year for the front panels– it had been sitting in my stash awaiting a project that would do the gorgeous pattern justice. Just using the star-printed sheet I used for backing would have made the whole thing far quicker and easier to assemble. Measure the length of the frame from the top rung to the floor, then back up to the bottom rung x the width of the inside of the frame. 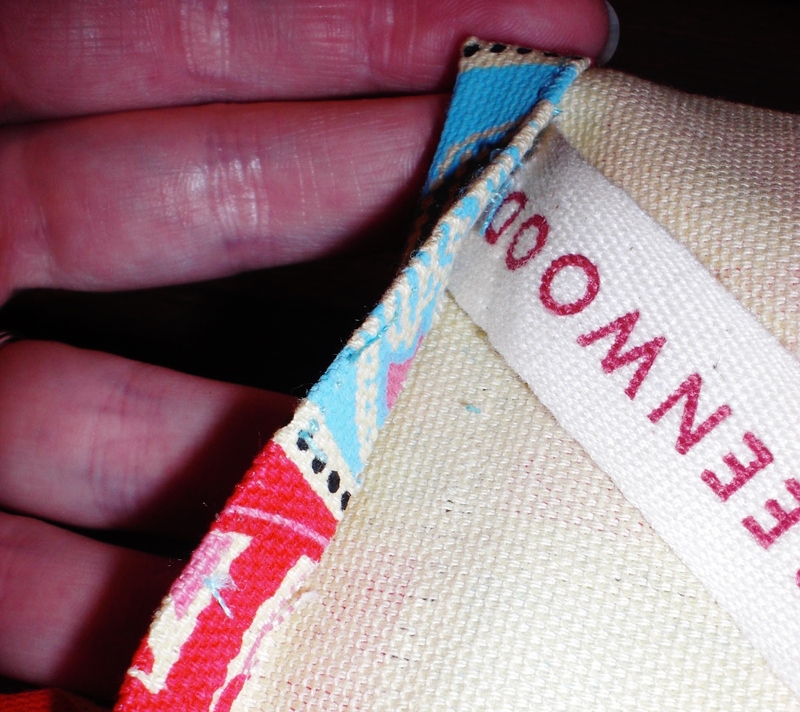 Add seam allowance on all sides PLUS 2 inches for fold-over at bottom edge. Cut this twice, hem 3 sides right sides together, turn and top-stitch the top edge, inserting ties/ribbons into either corner. Measure the drop from each rung to the rung below x width, add seam allowance and 2 inches for fold-over at the top edge, and cut two panels this size for each of the upper rungs (remember, the bottom run will already be accounted for). Again, hem three sides right sides facing, turn the right way, and top-stitch the top. It makes sense to top-stitch the top of the panel as this will be stitched over the bar. Assuming a 4-rung airer like mine, you now have one very long piece of fabric and three short panels. Taking the very long piece with ties at the top, pin the bottom hem over the bottom rung, fold an inch above the floor, and bring the backing up to the top rung, and tie at corners. Lie the whole thing flat, and use to position the bottom edge of each panel onto the backing, hanging down. 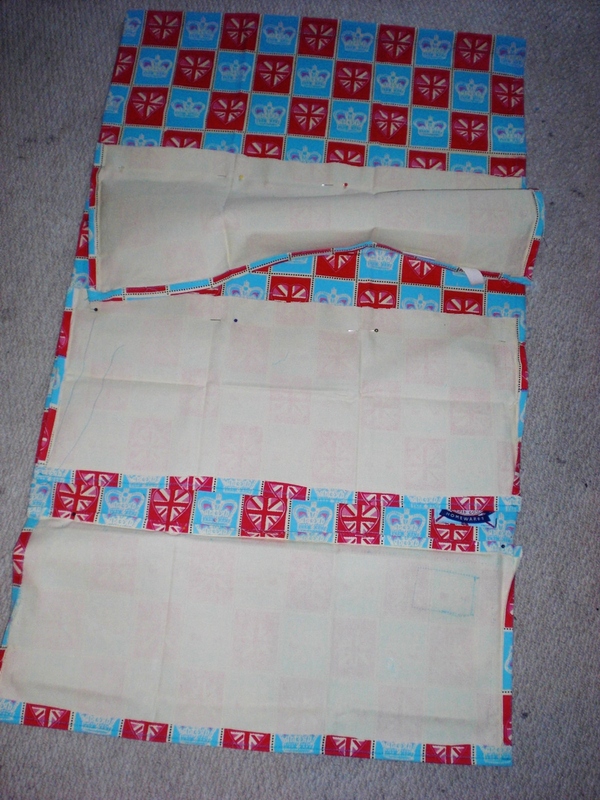 Pin, remove ties and pins from bottom rung, then machine two rows of straight stitch ¼ inch apart to attach each panel. Tie top and fold and pin bottom once more, and fold each panel up over the above rung. Hand-stitch securely in place. 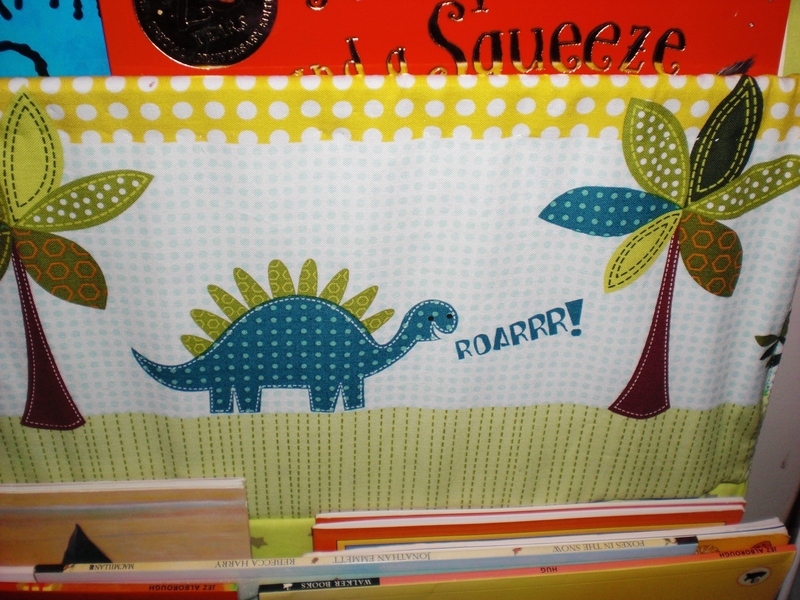 *instructions assume only one fabric without a right way up – so no dinosaurs. Ideally, you’ll want to mount this on a wall with hooks to secure each rung, allowing for even distribution of weight. As I said, this isn’t really an option in our house, but I am looking for a hinged wooden stand I can mount it on using pins to offer a sturdier base as the boys get older and more “hands-on”! 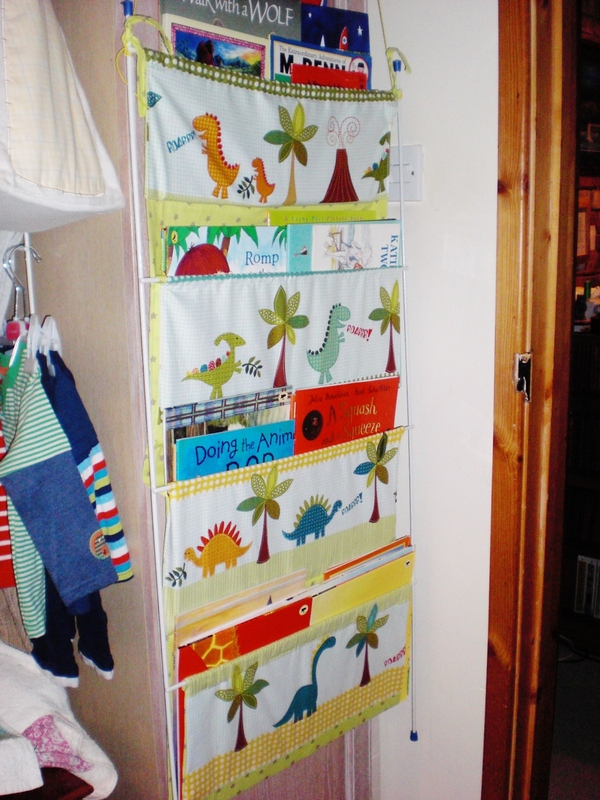 And speaking of repurposed kids’ storage, I will DEFINITELY be copying this idea! Last time I stocked up my sock stash, I also bought a couple of pairs of boys’ gloves, which I was drawn to because of their colourful stripes. I had in mind a dinosaur toy of some description. The above is the result of a couple of hours fiddling last night. 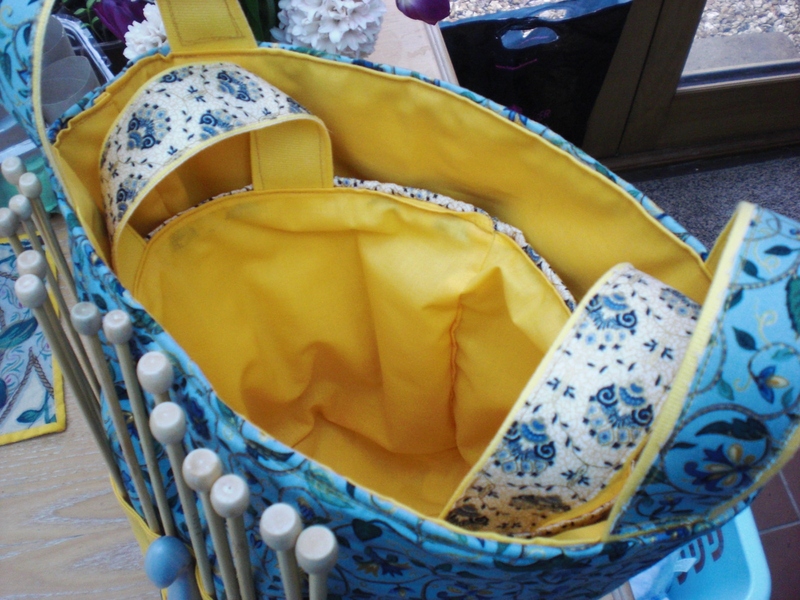 I’ll be putting a tutorial on sew make believe sometime soon, if you fancy having a go for yourselves! I’ve fallen off the blog wagon again, hey? I’ve just had rather a hectic week or so, and not much that would actually interest you… This weekend, for example, I went home because my Step-Dad was in hospital having a hip replacement. Ben, my Mum and I had a delicious Chinese takeaway on Friday night, and Ben and I had a glorious walk on Saturday before visiting Pete in the hopsital on Saturday afternoon… But none of that really justifies outfit shots! The above, in fact, is from LAST Saturday, a grocery shopping trip in the rain I’ve not even had time to tell y’all about!